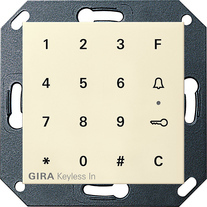 Keypad as an access control system with a capacitive and therefore wear-free button field. Frequently used number combinations cannot be recognised. Stand-alone device or in combination with the Gira door communication system as a door call system for buildings with several residential units. Special button "Key": Direct door opening when the correct code has been entered. Special button "F": Switching functions with switching actuators of the Gira door communication system. Master PIN number provided on included sealed safety card if Administrator PIN number is lost. Up to 32-digit codes are possible. Audible feedback when button is pressed. Three-colour LED status display during programming and operation. Warning tone in case of unauthorised removal of the keypad top unit for tamper detection. Tampering circuit with switching actuator in the Gira door communication system. The two integrated 2--way switch relays can be assigned two different codes, e.g. Code 1: door opening, Code 2: switching outdoor light.